I am always interested in the way the French adopt English words into French, the culinary word “le dip” is used, instead of the translation “la trempette”. The English word is then further franglicised into a verb “Dipper” to Dip. Personally I prefer the sound of French words, dip sounds so Macdos (franglais for MacDonalds). A Trempette is ideal to serve with an “apero” or as part of a picnic. The accompaniment can be thin sliced vegetables or cheese straws. 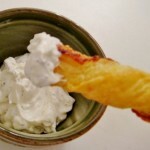 This week my “Trempette” is an amazing mixture of Petit suisse, (fresh cream cheese), raw garlic and Herbes de Provence. I made some cheese straws using Woolies butter puff pastry which rises beautifully. It took just a couple of minutes to prepare everything and the result was delicious. To prepare the cheese straws: I find the Woolworths butter puff pastry is the best to use for a maximum rise. Defrost the sheet of pastry and place on a flat board. Spread thinly with wholegrain mustard. Finely grate the cheese. Spread the cheese evenly across the top of the pastry and press down lightly so that it sticks. Put in fridge to cool pastry for about 15 minutes. Take pastry out of fridge and slice in half lengthwise then thinly slice each half in strips. Grease a baking tray or mat. Place the strips on the baking tray leaving a bit of room either side of each strip. You can also twist the strips to create a pattern. Bake in the lower half of the oven for 15 / 20 minutes until golden and well risen. Remove from heat and allow to cool. To prepare the dip – Drain any extra liquid from the Petit Suisse pots, remove the paper film and place cheese in a bowl. Add a ¼ teaspooon of dried Herbes de provence or chop in fresh herbs such as parsley, thyme and chives, mix well together with a fork. 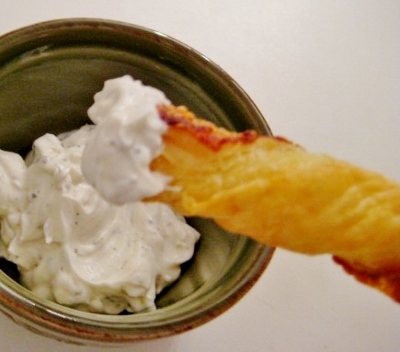 Serve in a bowl with a dish of the cheese straws. Alternatively serve with thin strips of raw carrots and celery.